Facebook is one of the most popular social networking platforms on the planet, with 2 billion people using it every month. This is a great way to stay in touch with family, friends, and group members. Even if you don’t like the “sharing personal stories” aspect of Facebook, you can still take advantage of its huge reach to share news about your artistic projects. This can let you stay in touch with fans and potential buyers. The icon for Facebook is a lowercase letter f in blue. Create a personal account. This is how you log into Facebook and manage everything else you do. Note that you don’t have to post anything personal if you don’t want to. You can simply post about your artwork, or nothing at all. This is simply a way to log into the Facebook system. This administrative personal account needs to be done with your actual name. If someone connects with you on your personal account that is called “friending”. When a friendship connection is made you can see all of their personal posts and they can see all of yours. Note that you can choose, when you make a post, to have it public to the world or private just for friends. 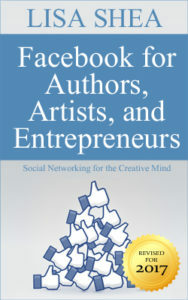 If you are using Facebook as a way to market your art you may choose to make those art-related posts “public”. That way anybody can see them, whether they are connected as a friend or not. To make your own fan page, just go to our fan page and click the ‘create a page’ button right on it. Strangers can follow our BVAA news without “friending” us and revealing their own personal posts. It provides a layer of privacy for them. They still get all the news and information from us, just without opening up their own private posts for view. Also, just as importantly, a regular “person” account has a hard upper limit of 5,000 people. Once you reach that limit you are done. That might seem like a lot at the beginning but it’s amazing how quickly you can reach that if you’re marketing your artwork. The fan page has no upper limit. You can get thousands upon thousands of followers to see what you’re doing. Many artists maintain both. They have a personal page and a fan page and they make art-related posts to both of them. That way they can reach both groups of people. Again, the main downside is that the personal page will hit that 5,000 limit and then be unable to friend with anybody else. It’s quite easy to make a post on Facebook. Simply click in the empty box at the top of your page, whether it’s your personal page or a fan page, and type something. Hit enter. It will go live. You can always delete it, so feel free to test away. To post a photo, just click the ‘Share a photo’ button immediately beneath that text box. It’s good to describe your photo – when people search they search on words. So if they search on “white egret” they will only find your photo if you described it with text as a “white egret”. The more key-word-rich descriptive you are, the more likely you are to be found in those searches. If you’re not on this list yet, let us know and we’ll add you in! Be sure to follow / friend your fellow BVAA members so you can see what they’re up to. You can “like” and comment on photos to add your support. Note that you can make a “friend list” in Facebook to organize friends. When you’re on a friend’s page, click the down-arrow next to the “Friends” indicator in the top right. By making a BVAA friend list you can easily glance at the list and see what those friends are doing, to like and support them. Note that Facebook only allows interactive graphic links for their fan pages – NOT for their personal pages. So another benefit of having a fan page is that you can promote it with the interactive link. Personal pages just get a straight text link :). You can see the difference in this list. If anybody has a fan page or personal page that isn’t shown here, let us know! Note you can add both personal pages and fan (business) pages to a list, to track both in one place. Facebook is HUGELY popular. Even if you personally dislike Facebook, it’s good to be on there for networking reasons. You don’t have to post ANYTHING personal. You can simply post images of your art. Heck, you can not post anything at all and simply stay up to date with the latest events in the groups you belong to. It’s a good idea to be in there, however you use it. Please use the “Share” button to share the news of upcoming shows and events.